Homemade melted cheese dip served w/ tortilla chips. Nacho chips, melted mozzarella, lettuce, salsa fresca, jalapeño peppers, & sour cream. 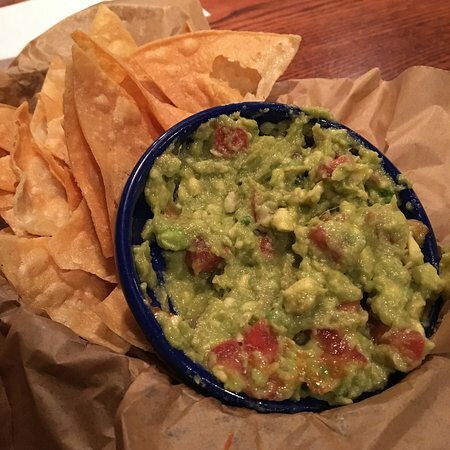 A large order of nacho chips w/ melted mozzarella cheese & guacamole. 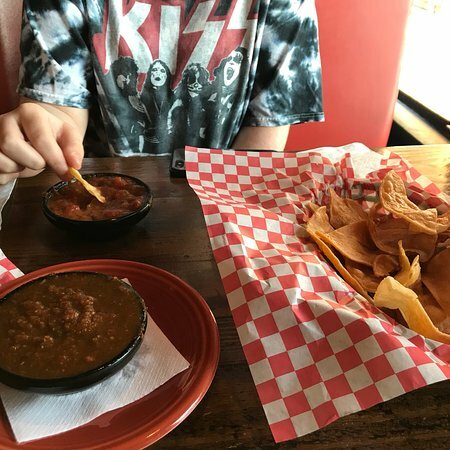 A​ large order of nacho chips, melted mozzarella cheese, lettuce, tomatoes, black olives, sour cream, guacamole & your choice of Salena’s chili, vegetarian chili, or black beans. Fried pinto beans covered in a thick layer of melted cheese. Served w/ salsa fresca & nacho chips. Served w/ a sweet & spicy chipotle glaze & salsa-bleu cheese dressing. Guajilo BBQ-glazed pork shanks served on the bone. Roasted corn-, black bean-, & cheese-stuffed poblano chile fried in a light egg batter & finished w/ a roasted tomato sauce. Mixed greens, julienne carrots, tomatoes, cucumbers, onions, & bell peppers. Your choice of dressing served on the side. Mixed greens, avocado, red onions, tomatoes, & queso fresco. Served w/ a cilantro-lime dressing on the side. Shredded lettuce, tossed w/ corn, black beans, diced grilled chicken, tortilla strips, & our salsa ranch dressing. A soft or hard shell corn tortilla topped w/ lettuce, tomatoes, & cheese. 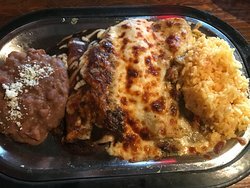 Includes one chicken enchilada w/ white sauce, one pork enchilada w/ green tomatillo sauce, & one beef enchilada w/ traditional red enchilada sauce. Served w/ rice & beans. Includes one chicken, one beef, & one cheese enchilada. Served w/ rice & beans. 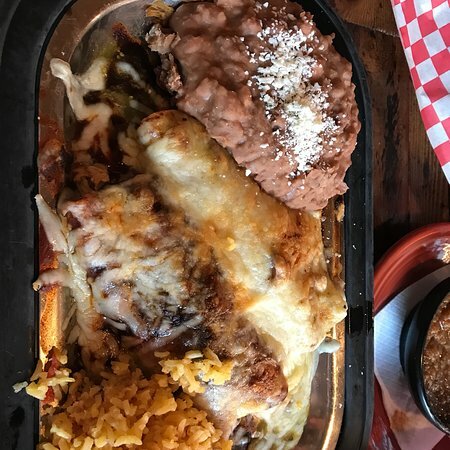 Includes one chicken enchilada w/ white sauce, one pork enchilada w/ green tomatillo sauce, one traditional beef enchilada, & one chicken enchilada w/ molé sauce. Served w/ rice & beans. Grilled 10oz. marinated chicken breast, topped w/ a three-cheese blend, finished w/ a savory chipotle cream sauce & salsa fresca. Served w/ rice & black beans. Spiced rubbed 10oz. chicken breast grilled & finished w/ our homemade mole sauce, salsa fresca & queso fresco. Served w/ rice & beans. Grilled 10oz. chicken breast rubbed w/ ancho-citrus seasoning—a blend of lemon, lime, orange, & dried red poblano peppers. Finished w/ salsa fresca & queso fresco. Served w/ rice & black beans. Habanero-spiced chicken breast topped w/ jalapenos, salsa fresca & queso fresco. Served w/ rice & black beans. 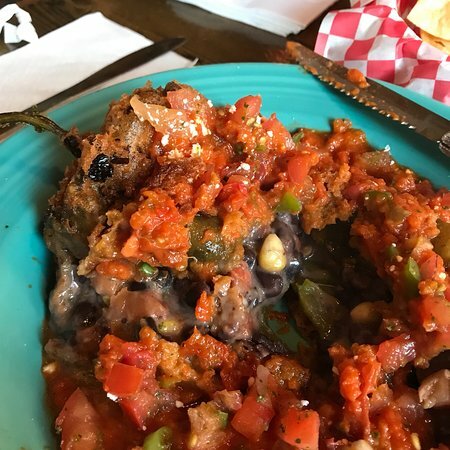 A fresh avocado stuffed w/ your choice of chicken or black beans, sauteed peppers & onions, & a melted three-cheese blend. Served w/ rice & beans. Fresh beer-battered cod, lightly fried, & served in three warm corn tortillas filled w/ honey-lime slaw, salsa fresca, & queso fresco. Served w/ rice & black beans. Fresh 8oz. filet of mahi-mahi rubbed w/ habanero seasoning. Garnished w/ salsa fresca & queso fresco. Served w/ black beans & corn. Includes rice & beans. Accompanied by 3 flour tortillas, cheese, lettuce, tomatoes, onions, guacamole, sauteed peppers, sauteed onions, & sour cream. Sauteed yellow squash, zucchini, portabella mushrooms, red onions, & bell peppers. All combos include Mexican rice & beans. Super Combos also include lettuce, tomatoes, & sour cream. Flour tortilla w/ melted cheese. Flour tortilla w/ melted cheese & chicken. Flour tortilla w/ melted cheese & beef. 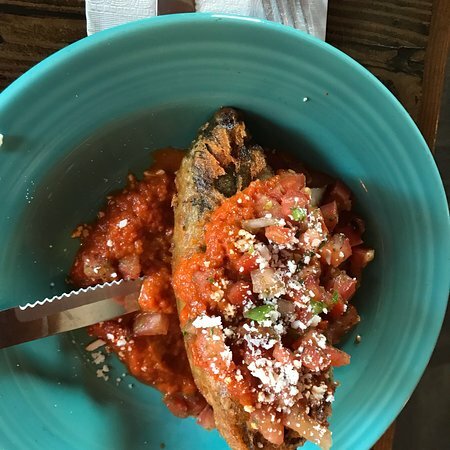 Any one item from the a la carte menu, served w/ Mexican rice & pinto beans. Caramel custard served w/ a rosette of whipped cream. Four fried dough squares rubbed w/ cinnamon sugar. Served w/ whipped cream & honey for dipping. Chocolate & coffee flavored frozen pie served in an Oreo crust. Topped w/ whipped cream. A house specialty. Cinnamon & corn battered vanilla ice cream, fried & served w/ chocolate sauce & whipped cream. Banana & cheesecake burrito, fried, rolled in cinnamon sugar, & drizzled w/ caramel sauce. Served w/ whipped cream. Traditional key lime pie in a graham cracker crust, topped w/ whipped cream. Crispy sticks of fried dough, sprinkled w/ cinnamon sugar. Served w/ a dish of caramel sauce for dipping. My husband and I brought our son here for his birthday dinner. My first time eating Mexican food. The food was delicious. Our waiter, Matthew, was very helpful in describing the different sauces for my burritos. I would definitely return! This is a good place to grab a quick satisfying meal if you are in the East Ave/University Ave. area. The service is very good and there is a good assortment of Mexican beer! I was pleasantly surprised by this restaurant. The food was good and the waiter was fantastic. I love it when you come across wait staff that does an outstanding job! I believe his name was Joshua. Went here during a recent trip to Rochester. Decent atmosphere and very friendly wait staff. Ordered the cheese enchiladas and the jalapeño cheese appetizer. The appetizer was stellar but the main course was just ok. The food is good. The drinks are good. Pleasant atmosphere. The service was good. And we had a good time. Great quick service ...food was average. 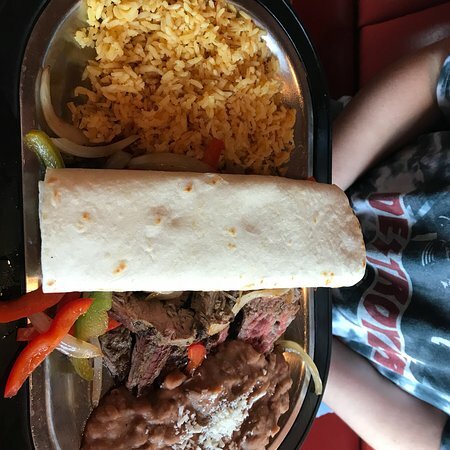 We did not have to wait long,the person who seated us was very friendly..I normally don't like mexican food but my daughter recommended it.The waitress was very friendly and explained different dishes to us,The food was very good,i enjoyed it and so did everyone else. 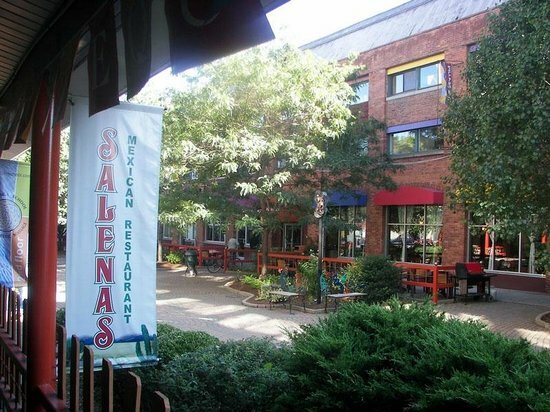 Get quick answers from Salena's Mexican Restaurant staff and past visitors. If they do, I wouldn't hire them. 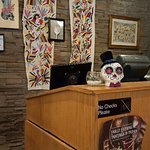 There are several Mexican food restaurants in the area with better tasting food.